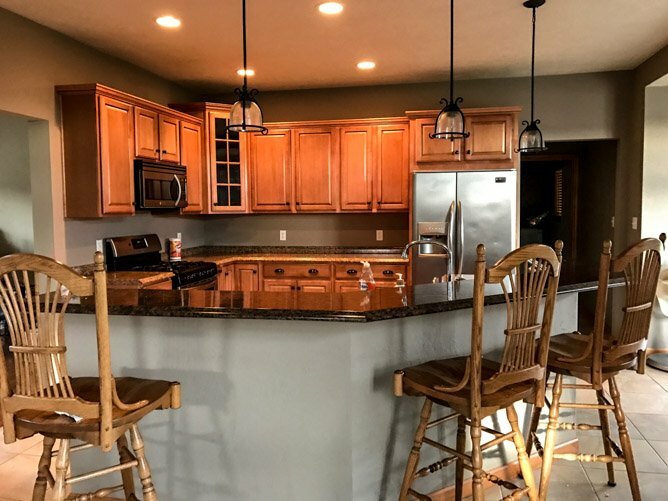 Kitchen Remodel: Before and After! Oh haaaay. I am finally showing you the before and afters of our kitchen remodel! Woohoo. You guys! This might be my most requested post ever. I go into a little bit of detail in the post, but you can see from the pictures that while the layout is the same, there are some big changes. And this is the first of a few posts to come, so leave any questions below! I’ll be going in up close and personal about the appliances I chose and doing some video walk throughs in the coming months! For a few months, we entertained the idea of taking down the wall between the kitchen and the dining room (the wall on the left side in the photos above) and almost decided to do it. It would have given us so many more options for things we wanted (and when I say “we,” I really just mean me because Eddie could care less about the kitchen and just wants to make sure he can grill a burger, truly), but ultimately we knew that no matter what, it wouldn’t be my dream space. I was super pregnant when we moved in here and while I really love our house, I have no idea how I overlooked some important kitchen details. Maybe I just loved the rest of the house more! I chalk it up to crazy pregnancy hormones and book-release date hormones. We also figured that putting that much money into the kitchen is something we wouldn’t get back any time soon (it seriously required restructuring a lot of the house) and we don’t know if we will stay here. So we decided to work within the kitchen skeleton that we had and I’m really glad that we did. The darkness. I don’t even feel like these pictures do justice for just how DARK this kitchen was. I swear it took a toll on our moods, haha. The gloom and doom shade on the walls (which you are probably familiar with if you watched my vlogs before Christmas) coupled with there being NO natural light in the kitchen and with the darker cabinets and counters made the area so, so, SO dark. Like, I’m not talking about dark for my photography. I still don’t photograph things in my kitchen, nor could I ever, because there is no natural light and unless we chop off the top of our house and install skylights, it isn’t possible. But just LIVING in this space with so much darkness was crazy. Eddie also LOATHED the pendant lights above the bar area and hated having them on – like they almost hurt his eyes. So at times, it would be even darker! The two-tiered counter. This was so useless for us. It lessened the counter space, made it so impossible to entertain and cut the room in half. It appeared that we had a lot of counter space, but it wasn’t utilized well. It was all choppy. I’m so short that I could barely set large pots on that top level. The countertops were also different shades and super dark. Not that I’d never choose dark finished or counters – I actually don’t mind them. But these were so warm and dark. I live for cool tones. And most importantly, I wanted a space to be able to shoot videos and do projects that required me IN the kitchen. Spoiler alert: I did this last Friday. (!!!!!!!) That was impossible before. I have no desire or plans to have a studio kitchen and wanted to make a space I loved workable and enjoyable! The main thing I wanted was lighter cabinets, a one-level center island and a cooktop in the center. Yes, I am in the camp that wants an all-white kitchen. I always have. Even before pinterest existed! Going full blown white wasn’t really an option here unless we want to redo a lot of other things in our home, so we went with this color call chai. Makes me want to eat the cabinets. CHAI LATTE yes please. It’s a taupe-y shade. And obviously, a change of paint color! I believe the color on the walls now is called west highland white. So, we moved most of the appliances to the opposite side of the island and put the cooktop in the center. This cooktop is AMAZING. Holy cow. It boils water in moments. I’m going to give you a really in depth look at the appliances in a few weeks! I did partner with KitchenAid for my appliances and let me tell you… after having years of subpar appliances, these are insane. I knew I wanted to go with KitchenAid because my cousin Lacy’s condo was done entirely in KitchenAid appliances and I’ve been obsessed for years. I can’t even take how much I love them. The bar stools are from Wayfair and are called the Ocean City Swivel. I love that they swivel the entire way around! Wayfair graciously sent these to me to have in our kitchen. LOVE LOVE LOVE the new kitchen!!! It is definitely bigger and brighter looking by A LOT! I love white kitchens, and like your lightened up counters tops. I am not a fan of two-tiered islands, as like you mentioned, they don’t seem functional at all; I’ve never had one, but I have always assumed what you confirmed. I love the shelves you put in with the flower pots and your cookbook!!!!! So awesome!!! Actually, we made your pretzel wrapped dogs with cheddar beer sauce the other day, which I don’t think was from the book, but was so awesome. Also, yesterday I made your smoked cheddar mac and cheese, and it was a HUGE hit. I’m excited to make it for guests some time. The only thing I would do differently than most people are doing these days with kitchens, is I woudn’t want a cook top or a sink on the island. I like the idea of a completely clear counter for a work space, and also since I love to entertain, a clear island would be a great place to put food, a centerpiece etc. Anyway, amazing job – I am super impressed!!! Also, I love your recipes!!! This looks great! I can’t wait to hear more! Did you opt not to install an exterior vent hood over the cooktop? If not, why? I desperately need to remodel my kitchen and feel like I need a vent because I tend to pan fry a LOT! What are your thoughts? Those swivel stools look perfect for use in a tiny condo as extra seating and/or dining. Great choices! Oh. My. GOD. You have like 4 ovens, Jess. What an absolute DREAM. Our kitchen is super dark, too, and we’re holding off upgrading because we might be moving (north!) in the next 6 months or so…I guess I’ll just keep dreaming about YOUR kitchen while I play on my Barf1978FormicaCountertops. We’re looking for a new house right now and my biggest issue has been wall ovens and the island range’ s. I despise them and as soon as I walk into a kitchen I’m telling my husband he has to rip them out. However, your range has me reconsidering…I would still have to rip out the ugly range and replace it with a Kitchenaid, but I’m definitely warming up to the idea! Ok, the kitchen is gorgeous, but WHERE DID YOU GET THE VASE? I love it and need it!! Wow! I love it! So much brighter and more inviting for guests. I love the stove rearrangement, like a chef counter where a guest can enjoy the show and steal a piece of sizzling grub when Chef’s not looking ;) . I also love the cupboard to ceiling with crown moulding. Gorgeous! and deals with all of that empty dust collecting space. Ovens, ovens everywhere! Now that’s a kitchen! Thank you for sharing. It’s gorgeous Jessica! I love every detail. Light, airy and inviting. I adore the back splash. The light fixtures are perfect! Who are they by? Your kitchen is gorgeous! I love the all white, and especially that column of tile above the sink – beautiful! Love the new kitchen! The single level island looks so nice. And I would not have thought of double ovens in the island, but I might be obsessed with it now! Have fun cooking way more in this space! Looks gorgeous!! Love all the light and bright tones! Great choices, those appliances are awesome! I love how you have shelves that keep your cook book front and center. Something you should be so proud of! Hi could you tell me the color of your new cabinets? I have a similar tile and am looking for a cabinet to compliment it. Also did you replace your cabinets or did you refurbish and paint them? Thanks so much. Love your blog! The kitchen looks amazing. These are some great ideas for my next home project. Thank you for sharing. I love your website and wanted you to know when it came time for us to purchase a new dishwasher I remembered you recommended Kitchenaid appliances so I decided to take a look and after using another brand for YEARS, I went with the Kitchenaid. I absolutely love it and when the time comes to purchase other appliances I will definitely consider Kitchenaid again. Such a amazing kitchen you have. These are some great ideas for my next home project. Great choices, those appliances are awesome! I love how you have shelves that keep your cook book front and center. So i am going to apply it on my kitchen when i remodel my kitchen. Thanks for the sharing your great experience with all of us.